AIC in black, Iona in stripes. Photos Adam Smith. Head Coach Bruce McLane sat down several starters due to an internal disciplinary issue, and it was a gutsy call as Iona was forced to rely on some 2nd-side players and some starters being moved around. Well, you wouldn’t have known they were shorthanded as Iona swarmed the AIC backline and forced the Yellow Jackets to work for every meter. It wasn’t until well into the first half that AIC got on the scoreboard - a turnover in the ruck allowing flyhalf Jihad Khabir to burst up the sideline for a try. But Iona replied with a long period of physical phase play. Center Mike Scarcella chipped over the line, re-gathered, and scored a brilliant try. With the conversion, Iona led 7-5. Shocked a little AIC got to work. In the second half, slowly it started to turn toward AIC, but it was certainly slowly. Iona had received a superb effort from Scarcella, but he went down with a shoulder injury. That moved flanker Greg Amaty from flanker to center. Santi Mascolo, a freshman, was a superb runner at outside center but was also the Gaels’ main lineout jumper - typical of McLane’s willingness to move players around. No. 8 Jon Petteruti was part of a brave forward effort, and scrumhalf Bryce Stanback was hugely active. But the injuries started to tell, and AIC because to work the phases and be more patient. Christian Adams started to bust through the gain line, and Khabir started to create space for others. Marcus McIntyre and Skyler Adams fronted up well, and everyone got involved as Werner scampered over, and then when Matty Jones pushed and wriggled his way to make it 19-7. That, said Christian Adams, was a big try. Meanwhile, Guiry was happy to see his team just settle down. Adams went over to finish it off. It was 26-7 in the end, but it was 12-7 with about 12 minutes to go, and Iona, battered as they were, proved plenty with their performance. In the second game, Temple, with the power running of Michael Welstein and the shiftiness of Oscar Hernandez, torched Mary Washington for early tries. 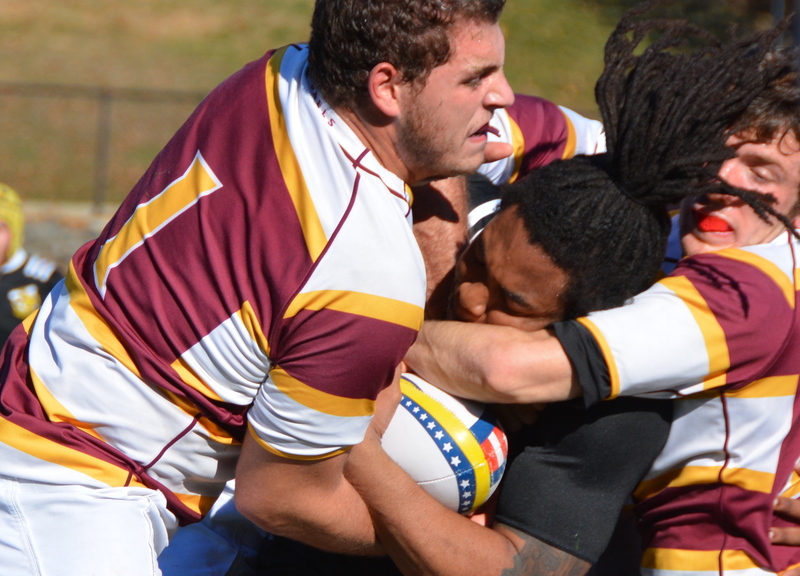 But eventually, with prop Ryan Iskowitz leading a big, heavy pack, UMW started to work their way back into the game. It wasn’t until flyhalf Ryan Clegg scampered through well into the second half that UMW led, but after that they held on. UMW stuck to the game plan, even when they were losing, and that was the key in the 40-29 win. In the third game of the game, Rutgers and Stony Brook struggled to string plays together early. But as the temperatures dropped, Stony Brook heated up. The Seawolves ran their game plan, working the interior channels and then quickly spinning it out wide. Flyhalf Bryan Michel ran the offense impressively, staying on task and setting up his runners. As a result, Michel got an early try because he faked passes to the left and right, and that opened up a hole for him. Adam Freeman was a key runner from deep, while up front, the forward pack defended bravely. Flanker Steven Kopcho scored the first Stony Brook try and was a force. But the guy who led the defensive effort was lock Jed Hendrixson. He was the one who took on the huge Rutgers No. 8 Jamil Pollard, and did it right, chopping Pollard at the ankles and taking the big Rutgers runner down. Rutgers struggled to keep the game moving, and lost the ball too much. It played into the Stony Brook hands, and the Seawolves emerged 29-12 winners.